Each holiday season, I've received many requests for recipes for the "Italian Feast of the Seven Fishes" Christmas Eve dinner. Some also wonder what the various dishes symbolize. These are extremely difficult questions to answer because the dishes served may vary from town to town or even family to family, and none of my Southern Italian cookbooks attach a particular significance to any particular Christmas Eve dish. In fact, the "Feast of the Seven Fishes" is not an Italian tradition, but an Italian-American one. 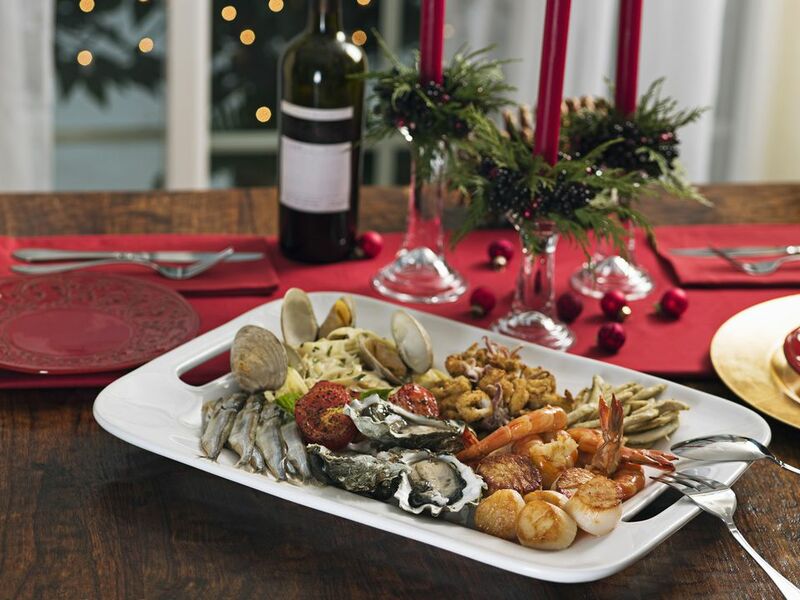 While many Italians do eat fish- and seafood-based meals for Christmas Eve (La Vigilia di Natale), nowhere in Italy is there a specific "seven-fish" meal. The reason behind the use of fish, on the other hand, is simple: Christmas Eve is a vigilia di magro ("lean feast") in other words, a day of abstinence in which the Catholic Church prohibits the consumption of meat. Though this stricture is less stringently observed now, in the past it meant that everyone would crowd the fish market on Christmas Eve, and Italian cookbook author Livio Jannattoni gives a wonderful description of the society dons and their dames gliding between the tubs of slithering eels and tables of shellfish and other delicacies in the Roman fish markets of the 1920s, their elegant clothing and fine shoes contrasting oddly with the cold, wet floors and the gruff fishmongers bent on making deals. Speaking of Naples, on the other hand, Caròla Francesconi writes, in La Cucina di Napoli, "The week before decisions are made regarding the three Christmas dinners, Christmas Eve, Christmas and Prima Festa (the 26th). The Christmas Eve dinner is more traditional than the others and must include:"
A choice of: Spaghetti Aglio e Olio, Linguine in Anchovy Sauce, or Vermicelli or Spaghetti alle Vongole (with clams and tomatoes) as the pasta dish. Roasted or fried eel (capitone) followed by other fish dishes of choice, which could range, depending upon the dinner's budget, from humble baccalà to a baked whole fish or luxurious raw oysters or roast lobster. A refreshing caponata di pesce (fish caponata) to wrap up the main dishes. Christmas desserts, including: paste reali (elaborate, colorful fruits made of marzipan), and a variety of cookies, including: susamielli (S-shaped almond cookies), rococò and mustacciuoli. And finally, dried fruit (dates, figs, nuts, and la collana del prete (the priest's necklace), a ring of chestnuts strung together). The Christmas day menu, she notes, is much freer -- baked pasta, either lasagna or a timpano, roasts -- fish for those who like it and capon or turkey, caponata, and dessert. The only requirement for the Christmas Day dessert is struffoli. Even freer is the third of the dinners, on December 26th, or Santo Stefano, which some people begin with tagliatelle with a ricotta-based ragú, and others do not. One important thing to note about Ms. Francesconi's menu suggestions is that she doesn't specify the number of dishes to be served -- this will vary depending upon the number of diners. Another is that she mentions only traditional Neapolitan Christmas pastries. Modern marketing is a powerful force, and now, in addition to the traditional Neapolitan desserts, you will almost certainly find either panettone (originating from Milan) or (from Verona), and possibly also panforte (a dense fruitcake from Siena dating to Medieval times) being served after a traditional Neapolitan Christmas Eve feast.